Gallery One One One is pleased to announce the opening of The Grand Western Canadian Screen Shop Collection: The Bill Lobchuk Donation. The exhibition features 28 works selected from 95 silkscreen prints produced at the legendary Grand Western Canadian Screen Shop, and donated to Gallery One One One by the founder of the Screen Shop, artist-printmaker Bill Lobchuk. Established in Winnipeg in 1968, The Grand Western Canadian Screen Shop was the first print shop of its kind in Western Canada. 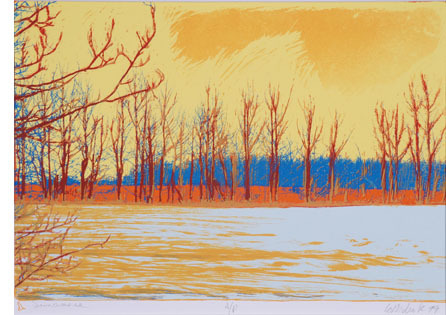 During its 20 year existence, it earned the reputation as being at the forefront of experimental printmaking technology, and became one of the most important artistic forces in Canadian art. Many prominent Canadian artists worked at the Screen Shop and several are represented here, including Daphne Odjig, Jackson Beardy, Carl Ray, Pierre Ayot, and General Idea. The Screen Shop was also the hub of printmaking production and distribution for numerous outstanding Prairie printers and artists, such as Judith Allsopp, Louis Bako, Joe Fafard, Chris Finn, Randy Gledhill, Ted Howorth, Winston Leathers, Bill Lobchuk, Don Proch, Tony Tascona, and David Thauberger to name just a few of the artists highlighted in the exhibition. The Grand Western Canadian Screen Shop Collection: The Bill Lobchuk Donation is the first in a series of three shows in 2010 intended to acknowledge and to celebrate the role of private donors to the gallery and their important contributions, not only to Gallery One One One, but also to the School of Art and the University of Manitoba. Following the Screen Shop Collection exhibition will be exhibitions of works selected from donations by Winnipeg artist Frank Mikuska and collectors Anna and Lyle Silverman.